Based on the machine tool holding concept of a collet, this Seagull innovation had empowered an industry for 25 years. Excellent disk centering is inherent as is low distortion and marking characteristics. This clamp has the most forgiving automation interface available and can operate in very adverse conditions to fill a wide range of needs. Most of these clamps sold are still in service today. 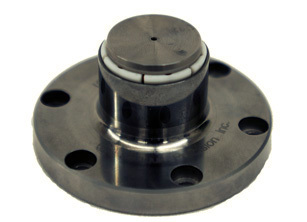 2) Near 360 degree distortion free clamping. 5) Available in all material and dimensional configurations.